Service, though selfless, should be duly recognized and encouraged. If the knowledge, wisdom, and talent of those who serve society are ignored and left to languish, it is society’s loss. In order to prevent such tragedy, the Mata Amritanandamayi Math has conferred its annual Amrita Keerti Award since 2001, distinguishing people who have made significant contributions to Indian Culture and the Vedic tradition. 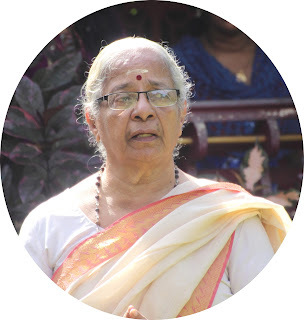 The goal is to assist the preservation of the ancient and enduring human values of Sanatana Dharma.The awards are presented each year on Amma’s birthday. Two categories of people are eligible to receive the award: those engaged in writing original, in-depth studies of India’s spiritual texts and those dedicated to constructive social or national service. Sannyasins are not eligible for the award, as their service is part of their spiritual practices. 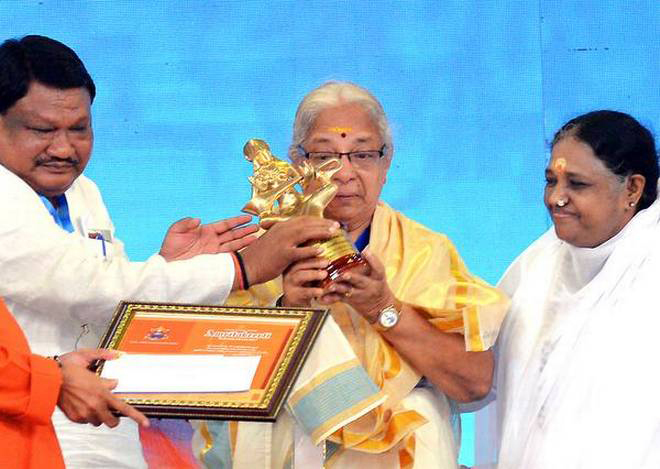 Sri Jual Oram, Union Minister for Tribal Affairs, presenting the Amrita Keerti Puraskar to Dr. M. Lakshmi Kumari in the presence of Mata Amritanandamayi on Monday. My most humble Pranaams to most revered Mother Mata Amritananda Mayi Devi, her huge retinue of highly devoted and dedicated disciples, sevikas and sevakas, most respected dignitaries on the stage, and brothers and sisters who have assembled here to partake the Prasad which Amma distributes on her birthday everywhere. All of us have heard the story of the squirrel who helped Sree Rama during the construction of the Great Ramasethu, how, picking up sand grains and putting up in the Sethu he made himself immortal receiving the grace of Sree Rama. Amma’s contributions to the welfare of humanity and preservation of Hindu Dharma cannot be described even by thousand tongued Anantha. What wonders me is how in this mammoth service programmes she could recognize this small squirrel and confer her blessings on it. I humbly accept the award, taking it to be recognition by the Divine Mother Herself executed through our beloved Mother. Such an occasion demands that I express my gratitude to all those who were responsible for making me what I am today. First in the line is my adorable father who put up the strikingly attractive picture of Swami Vivekananda in Chicago posture in our home and opened up the spring of guru-bhakti when I was just 12 or 13 years old. It was he who lighted up the Vivekadeep in my heart. Later my mother saw to it that this Vivekadeepa doesn’t get extinguished and when the call came permitted me to offer my life at the feet of my master at Vivekananda Kendra. It was Swargeeya Agamananda Swami who awakened in me the very first waves of spiritual yearnings. Those were further nourished by the two great teachers of modern India, Swami Ranganathanandaji and Swami Chinmayanandaji. It is through them that I tasted the practical Vedanta of Swami Vivekananda. Even with such a treasure chest in my possession, the attractions of materialistic life kept their grip on me like an octopus. 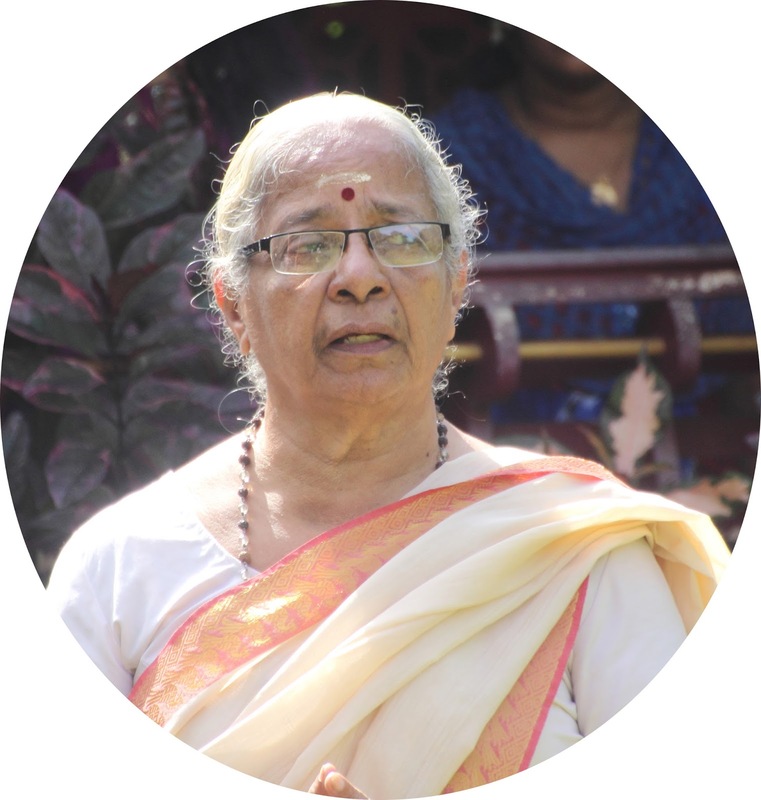 It was none other than Swargeeya Eknathji Ranade, the Master Builder of Vivekananda Rock Memorial and Founder of the spiritually oriented service mission Vivekananda Kendra, who pulled me out of that mire and handed over the responsibility of looking after Vivekananda Kendra as its Mother. Thus was fulfilled my dream of surrendering my life for the service of Swami Vivekananda. This award reminds me of the magnificent gift which Eknathji gave me by which I rediscovered myself. The cumulative effect of all the love and respect with which the well-wishers of Vivekananda Kendra all over India received me have now become consolidated in Mata Amritananda Mayi’s choice of me to receive the Amrita Keerthi Puraskar. This will definitely add a special glow to the evening of my life. To mother, I offer my shathakodi pranaams. My thanks also to the selection committee for choosing me. Last but not the least, once again I assert ‘Apara Mahima Guru Mahima’.